For Valentine's Day my son needed a box to take home his cards and candy. Of course in the age of Pinterest just sending him with any old box just won't do. So with the Super Bowl victory fresh on our minds we re-created the Broncos football field. Originally I tried to use green tissue paper to cover the box but that was a complete and utter failure. Duct tape came to the rescue. Not only was using duct tape a lot easier it strengthened the box for the mountains of candy and love it would bring home. Computer, printer and internet (for the graphics) or download the pdf containing all the graphics. We started by cutting the green construction paper to the shape of the top of the box and taping down the edges. FYI, the included endzone graphics are approx 6.5" wide. That would be the ideal width for your field. We then wrapped the entire box with blue and orange tape. The design is completely up to how you wrap the tape around the box. Print out the graphics from the included PDF or download from internet. If you're looking for a different team, google "[your team name] logo" and then "[your team name] end zone." Cut out all graphics and glue down end zones. Using a a ruler, mark and draw all the yard lines you want on the field. Glue down mid-field logo, first down line (yellow) and scrimmage line (blue). Wrap cake pop sticks or whatever you are using in colored tape. 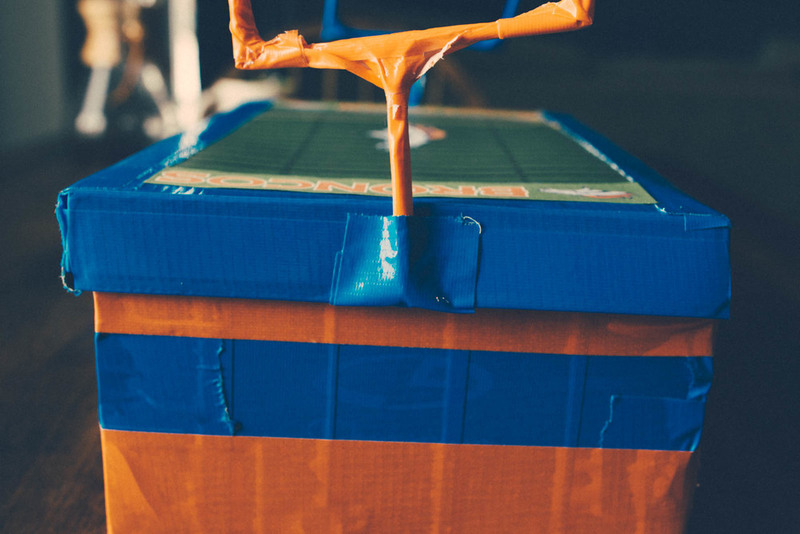 Admittedly this was a quick and dirty process, but tape together the cake pop sticks in the shape of goal posts. Tape goal posts to side of box. We needed to cut the bottom of the post so it wouldn't stick over the edge of the top of the box. Glue Super Bowl logo wherever you want because the champs are here! Enjoy the excitement with your child!